Yeah! Now you’re talking! This is a piece of trash! Easy! It’s lively trash, trash with gusto. It’s essentially a Psycho fan film made by a kid. This kid has also seen Rear Window and Rope, and a lot of B movies, and probably some pornos. He’s definitely watched the dream sequence from Rosemary’s Baby a bunch of times and gotten stoned and argued about it with his friends. This kid loves these things, as only a fan can love, to the point where he feels like he’s in some sense their author. The way the boy in The Squid and the Whale tells people he wrote the Pink Floyd song he identifies with, because he feels like he might as well have written it: he could have written it, so essentially, he did. Well, this kid loves Hitchcock so much he wants you to know he might as well have been Alfred Hitchcock and made his movies. Maybe he is! Maybe he did! See? Look! A kid who’s 32 years old and already a successful filmmaker can still be a kid. He can certainly still be a fan. All artists start as fans but some artists are more fans than others. Some never outgrow it. Quentin Tarantino is in the same boat. You can travel a long way in that boat. Is Sisters a tribute? Pastiche? Homage? I strongly suspect that Brian De Palma had no such ambitions or concerns. This stuff was in his head; he just did the things that it occurred to him to do. Sisters is a pure and spontaneous product of his fandom. It’s fan art. I want to be clear about the degree of scorn I am expressing: very little. Fan art is real art, can be valuable. I think of Robert Crumb (in Crumb) talking about how he and his brothers ran obsessive variations on Disney’s Treasure Island until it had been made to bear all their demons, became unrecognizable, took on a strange and convoluted life of its own. The transmutation of one artist’s work into another artist’s work is fascinating and vital. 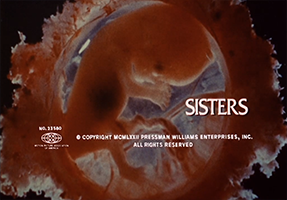 Sisters carries over its source materials mostly intact, but some degree of psychic digestion has occurred. The very same enthusiasm that drives De Palma to blithely re-enact entire scenes from Psycho and Rear Window also drives him to do some wacky experimentation with a split-screen, and to open with a kooky TV-show parody fake-out like something out of Monty Python. Why not? For him it all goes together. He’s just following his muse, doing his thing. “His thing” is 80% other movies he’s seen — but, you know, whose isn’t? By the way, both of those experiments are… successes? They’re certainly not failures. They’re something. The audience says “why not?” too. The idea that Brian De Palma is an auteur with a taste for deliberate “camp” and “deconstruction” seems to me dubious as always. It sure seems like he’s sincerely taking his best stab at it all. The result falls somewhere in the space between Mystery Science Theater 3000 and dignity. I’m happy to go exploring in that space. 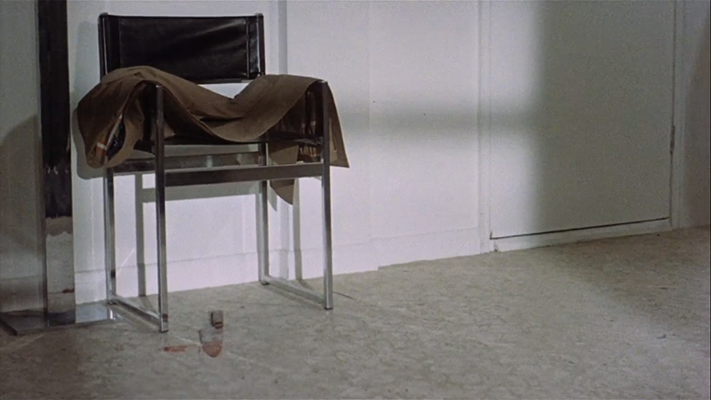 De Palma is, at the very least, irrepressible, which is its own sort of charm. This is not a movie constrained by any sense of shame; that’s a good cheerful feeling and I appreciate it. The hilarious grand clunker of a final shot wants you to think that you’re laughing with. I’m pretty sure I was laughing at. A De Palma fan would probably say that the important thing is that I was engaged. I can’t deny it! I originally intended just to get a taste of the opening of this movie, but ended up sitting through the whole thing in one go, in an unbroken chain of amusement. That’s a success! I do not recommend Sisters! But that doesn’t mean I had a bad time. Not at all. Margot Kidder is clearly amusing herself doing her dinner-party impression of “french girl,” which is a reasonably charming thing to watch. She was involved with Brian De Palma at the time. Not widely reported but it does help explain the movie. Jennifer Salt was her roommate. They lived on the beach. De Palma and De Niro and Scorsese and Spielberg and the whole gang from Easy Riders, Raging Bulls used to hang out at their place, get high, hook up with each other, etc. Also helpful to keep in mind. Featuring the youngest Charles Durning yet — for me, anyway — not doing a particularly good job, but I don’t blame him. His worthless character is a detective who announces that he’s a graduate of the “Brooklyn Institute of Modern Investigation.” I guess that might count as “camp”? It entertained me, at least. Now, would I like to check that stuff out? Do I plan to get the DVD from the library eventually and do it? Sure. I’ll come back and post about it here when I have. But am I gonna let it stop me from proceeding onward for the time being? No. That would be silly. Bernard Herrmann — yes, the actual Bernard Herrmann — is on hand. He knows exactly what’s up and does an expert impression of his own greatest hits, cranked up to schlock-hundred-and-ten. He throws in some Moog synthesizers, mostly to make wailing theremin noises. Just in case you weren’t sure whether this was a thriller. Moog sez: it is. Our selection is the Prelude. Meant to accompany ominous close-ups of fetuses with a terrifying case of prenatal Friz Quadrata. You can knock the movie all you like but let’s not deny that these are some pretty great titles. 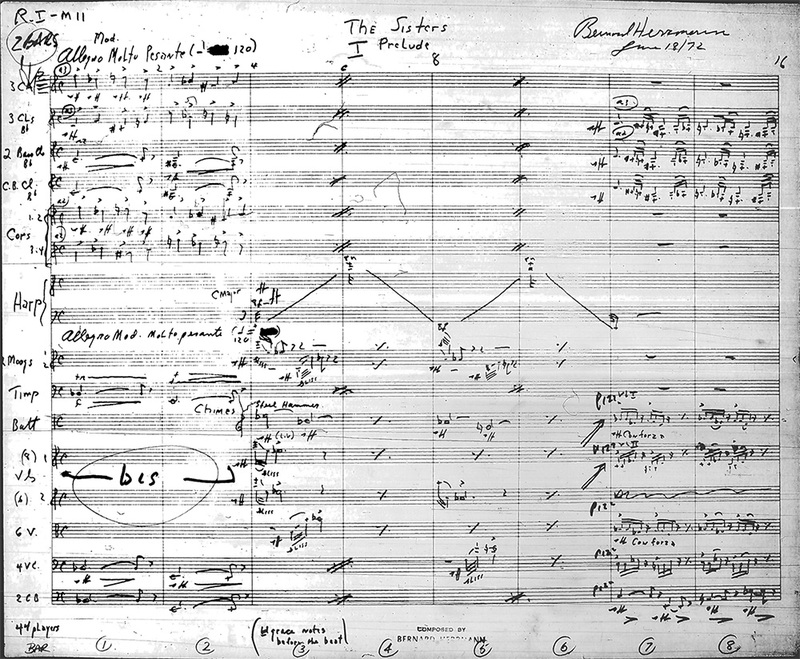 Bernard Herrmann was a great man. I’m glad to have seen this movie because it meant I got to hear one of his scores that I’d never heard before. It’s good.